Saint Francis Medical Center kicked off its annual Pink Up breast cancer awareness campaign with a bang on Thursday night. Nearly 1,600 guests, including breast cancer survivors, their families and supporters, and Southeast Missouri State University student athletes gathered at the Medical Center’s Cancer Institute for food, entertainment and shopping, all benefiting Dig for Life, Saint Francis’ program that provides free mammography screenings and other cancer services for local women who could not otherwise afford them. The evening featured the return of the Pink Up Choir, made up of singers and musicians from seven local churches and led by Barry Stone of Lynwood Baptist Church and a performance by 7-year-old twins Jayvon and Jayvion Biles of Charleston, Mo. 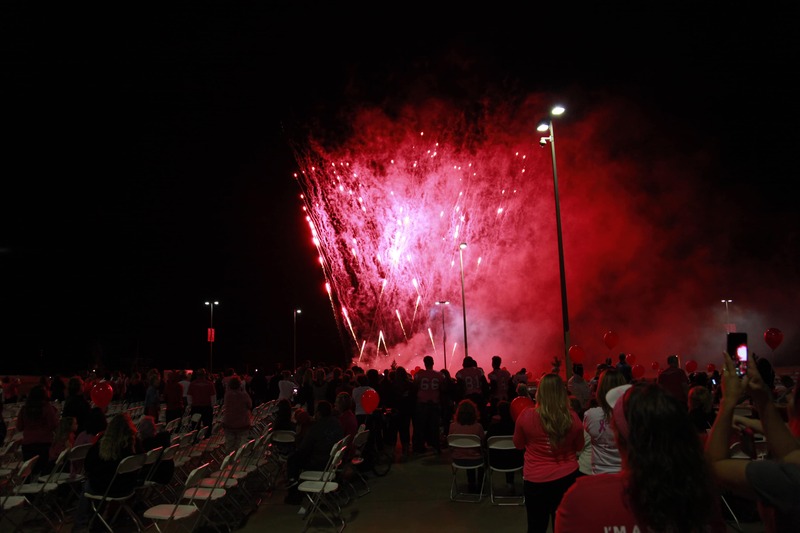 Country music artist Candy Coburn of Dexter, Mo., joined the choir for a performance of her breast cancer anthem, “Pink Warrior.” A spectacular fireworks finale brought the evening to a close. Saint Francis launched Pink Up Cape in 2010 to raise awareness of breast cancer in the community. During the campaign, residents are encouraged to “pink up” their homes and businesses in support of the cause. Proceeds benefit Dig for Life, a joint effort of Saint Francis Medical Center, Southeast Missouri State University and private donors that provides free mammograms to area women who otherwise could not afford them. Dig for Life provides more than 400 free mammograms to local women each year, and has provided nearly 3,000 free mammograms since 2000. Last year, more than 195 local businesses, 50 schools and countless individuals raised more than $215,000 in support of the program.